Before understanding if a particular solution will solve a problem it is better to understand the Problem in all its totality to plan a comprehensive solution. To give a brief history, the Greater Chennai Corporation about a decade back managed the entire Solid Waste Management functions with its own workforce. Subsequently it was decided that the cost of delivery of providing this service in-house by the Government was very high also with limited and unsatisfactory results. The decision was made to privatize municipal solid waste collection and transportation. The first experiment led to the privatization of central and southern Zones 9, 10, 13 of Greater Chennai Corporation. The first privatization contract was bagged by Onyx Pvt. Ltd. This significantly improved the quality of garbage collection. Waste removal was done at night. Staff of the company were given Provident Fund and periodic health checkups and incentives. The experience was very encouraging both for Greater Chennai Corporation and also welcomed by citizens who suddenly saw increased cleanliness on Chennai streets and had a clearly established Standard Operating Procedure for complaint escalation. Encouraged by this experience, Greater Chennai Corporation subsequently floated the tender after completion of the contract period and this time Neel Metal Fanalca (NMF). Since the tender specifications was not inline with the changing requirements of the citizens the project was not the best of the experiences for many to say the least. After NMF, Ramky Environmental Services was the awarded the contract. All the contracts for Municipal Solid Waste Collection and Transportation to the Perungudi Dumpyard were purely based on tipping models. So effectively all the waste generated by the city was transported and dumped in the open dumps situated next to the Pallikaranai Marshland. The payment to the solid waste management vendor is purely based on tonnage. So the incentive to find local solutions to the waste is counter productive to the vendor. In parallel over the years the Perungudi dumpyard has grown in size and has eaten lot into the marshland and also visibly altered the water quality. So there is a high pressure from multiple environment groups to stop this practice and the Greater Chennai Corporation has always agreed to do the same until an alternate is found. Why is Privatization a Problem Now? With its more that 15 years of private garbage outsourcing experience, why is garbage collection outsourcing such a big challenge? For beginners, Greater Chennai Corporation is currently planning to privatize another 8 zones in 2 packages of 4 zones each. This effectively means that in addition to the current 3 zones which are privatized, Greater Chennai Corporation will have a total of 11 Zones in private management. One of the main challenges is the Staff Management of changing tenders. There are 8246! (Yes! Eight Thousand Four Hundred and Six!) sanitation workers employed on a temporary basis by Chennai Corporation at Rs 362 per day for 6 hours of work. The private vendor would employ typically far lower number of staff and the vendor has no compulsion to use the same or continue offering the role. Job loss is a pressing issue at these testing times. Speaking on conditions of anonymity an official familiar with the subject says “Privatization does not guarantee a cleaner city! This has been our own experience in the city over the last 15 years” The current tender for the 8 zones is fixed at about Rs 1500 Crores for 8 years. “Lack of job guarantee is a very pressing issue” says a member of CITU union that is leading the talks with the Government. Additionally an impending election is only making the decision making more complex says an official familiar with the issue. The MSW rules of enacted by the Ministry of Environment, Government of India mandates that waste be collected as segregated from Door to Door. Also it mandates a clear timeline for various milestones. This requires a very strong procurement process with varied roles and has many stakeholders at multiple levels. Some of the stakeholders of the ecosystem are waste collectors, secondary recyclers, waste managers, waste processors among other things. Other cities have adopted varied combinations as part of their solid waste management strategy. 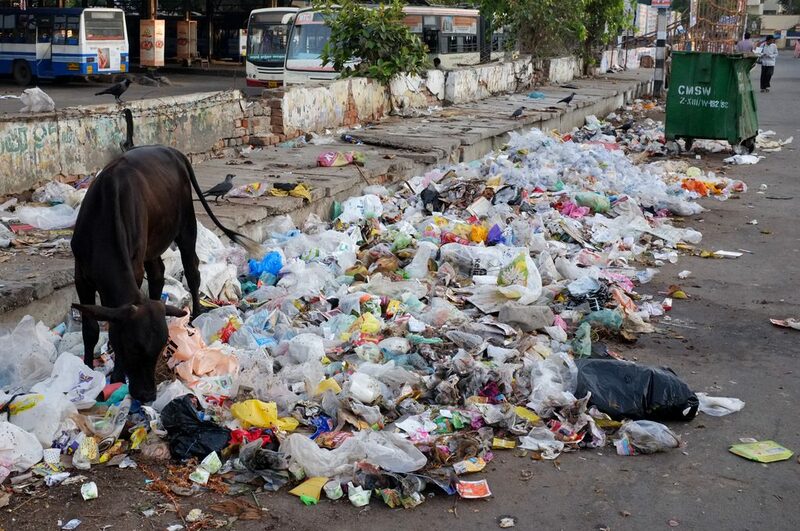 Bangalore and Pune have possibly done a the most bold processes to plan solid waste management. Bangalore has decentralized waste collection system and not tendered our larger prices to avoid risks in management. Also the tenders are of multiple combinations. Additionally both Bangalore and Pune have adopted strong SWM By-Laws to enforce segregated waste collection.